Another exciting week for electronic music lovers in Copenhagen has passed. 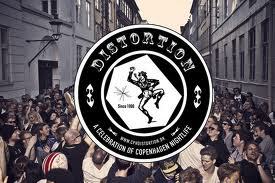 It started off with the Electronic Carneval, kept going with Distortion and ended up in Malmø, the Swedish "suburb" to Copenhagen. Distortion is a very unique and all free street festival that goes on in Copenhagen every May with over 300.000 people partying in the streets of Copenhagen during 5 days in different neighborhoods everyday and a massive final party/rave on the Saturday, and a chill out lounge thing on the Sunday for those who just can't get enough. Numerous names are playing during the festival, mostly electronic acts though, and several spontaneous and unofficial pop-up parties and flash raves everywhere around the city joins in along with the street host parties by local shops, bars etc. around the city. It truly is a special thing, I don't think there's anything else like this anywhere else on the planet. Wednesday, I went to Vor Frue Plads in central Copenhagen right between the Cathedral and the University in the old Latin quarter of Copenhagen. Danish top DJ Rune RK was hosting the event, he played a very nice set himself, and got people moving, but he had brought in the legendary UK DJ Pete Tong, you might know from the BBC Radio 1 show the Essential Mix on Friday nights. He will also appear at the Swedish House Mafia one-day event at Milton Keynes Bowl north of London in July, which I'm also going to see. The two of them put on a hell of a show and got the couple of thousand party people moving constantly. Thursday i went to check out Frederik Olufsen aka The Frederik, the local Danish newcomer on mau5trap, I saw him at the epic Mau5trap closing party at Amnesia during the Miami Music Week, along with Foreign Beggars, Moguai, Feed Me and the master himself, Deadmau5. This time he rocked the Skt. Hans square on the multicultural borough of Nørrebro in Copenhagen with hard hitting dubstep and electro sound. It was quite nice, but nothing like the party at Amnesia Miami, but then again, nothing really can compare to that. One thing is for sure, I'm going to keep a close eye on the young Mr. Olufsen in the future, which seems very promising for the young Danish dubstep producer. Morten Breum, the no. 1 danish superstar DJ, played on the second night at Distortion in front of maybe a thousand people, at a closed down gas station on outer Nørrebro. Among many great tracks, like his newest release Larva, he played the banger "Epic" by Sandro Silva and Quintino. What a sick tune! Btw, he's got a new one coming up on called 86 degrees, sounds very promising. After the Morten Breum show we, went to the nearby after party, that included three stages, of which we firstly was impressed with a very high energy and high tempo ghetto house set by Chicago house legend DJ Funk. Afterwards, italien DJ/producer Davide Squillace hypnotized us from the second second, with his deep house set. Even though Distortion was just getting started in Copenhagen, I decided not to follow the party masses to the next borough of Copenhagen, but instead, I went abroad on the Friday evening, to our neighboring baby sister city of Malmø in Sweden, to see Tommy Trash at Babel. I saw Tommy in Miami during Ultra Music Festival, and he really impressed me, so I was very excited to see him again, this time in my own back yard. Babel, the old church turned nightclub in central Malmø and the only place in the Øresund region (the water between Denmark and Sweden), with a very clear electro profile, had brought in headliner Tommy Trash, the Australian DJ and excellent remixer/producer, who came down to Malmø after his appearance at Summerburst Gothenburg. His performance was nothing short of excellent. Very good energy, throwing his signature long curly hair all around the place and mixing in both his on tracks, like Cascade below, and several of his amazing remixes. I was so fortunate that I got to greet and thank him for the show afterwards. Another amazing night at Babel and a spectacular week with tons of great music and lovely people! For some reason, most of the (better) nightclubs in Copenhagen are playing deep house, and as you might have figured out already, that's really not my thing. I mean it's OK to chill out to, but it doesn't turn on my party mode like the progressive or electro stuff does. I really appreciate coming over there once in a while to experience the great names they are getting in. The good people around Babel are always taking good care of me and my party people, so a big thanks to Peffe (Babel), Mattias (Department of Music) and Pierre (Save a Lollipop and Matchstick Men). Thank you guys!